Schuh’s emails stood out for being particularly thorough and providing constant updates as to the progress of my order. I placed the order on Friday evening and my wife’s shiny new Toms were delivered first thing on Monday morning. In the two-and-a-bit days that it took for the order to reach me, I received three emails and a text message from Schuh alerting me to its progress. Following delivery I received a further two emails confirming that the package had been dropped off and informing me of the returns process. In my opinion this is excellent customer service as it means I was never left wondering where my order was or when it would arrive. The email detailing returns information is a great idea, as offering simple and convenient returns is an important part of the customer experience. 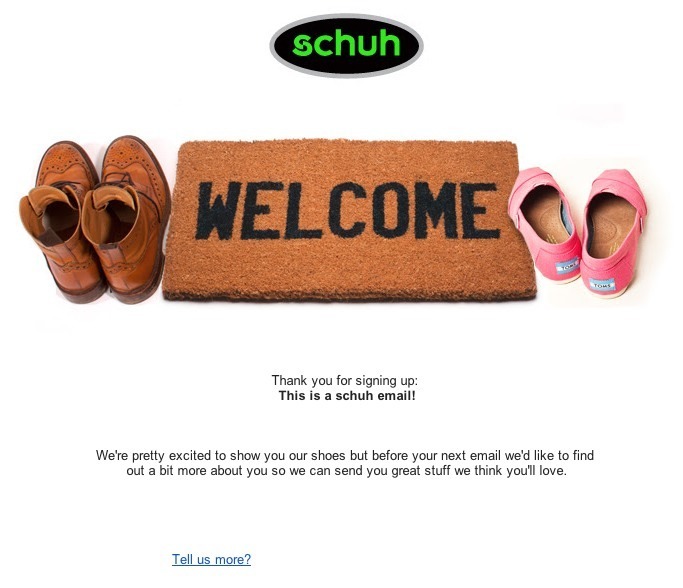 Schuh’s email includes the returns policy (I have 365 days to return them, which also adds to an excellent customer experience) and lists my nearest Collect+ drop off points. However, there is obviously room for improvement. For example, I received six emails from Schuh with three different sender IDs. It didn’t cause me any great confusion, but for consistency’s sake it would be good if they came from the same address. The main problem though is the email that arrived with the subject line, ‘This is a schuh email,” which obviously didn’t incite a great deal of interest. It was sent because I’m a new customer so the retailer is sensibly trying to grab a few extra personal details, but unfortunately the creative and the call-to-action are far from compelling. I ordered a jacket from Selfridges using click-and-collect, which is an increasingly important delivery option for multichannel retailers. This means that it requires fewer emails to keep me up-to-date with the delivery process as I just need to know that it has arrived ahead of my specified collection date. So far I’ve received only one email to confirm my order and I must say that it’s a triumph of inventive copywriting. While most retailers opt for a fairly generic subject line such as ‘Order confirmation’ or ‘Thanks for placing an order’, Selfridges goes for ‘You found something extraordinary’. You fell for something extraordinary at Selfridges.com – and now you have an order confirmation number to prove it. The email also contains a decent order summary and all the relevant collection information. Obviously it’s also important for Selfridges to back this email up with another confirming that my item has arrived, but I’ll have to wait and see whether that’s forthcoming. I also ordered a jacket from Mango, which unfortunately does mean that one or more of these brands will be receiving a returned item later this week. It’s also unfortunate that Mango’s automated emails don’t quite live up to the example set by Selfridges and Schuh. The first email I received to confirm my purchase went for the generic subject line, ‘Thanks for shopping at MANGO’, though on the plus side it did provide a decent order summary. Mango also needs to fix the CTAs within its emails, as the ‘Orders’ link just sent me to a blank page. Overall Mango’s emails are perfectly adequate and keep me informed of my order progress, but it doesn’t match the customer service levels offered by some of its competitors.